A man works on a tea processing machine in Lam Dong Province. All of the land zoned for tea production in the Central Highlands province of Lam Dong is dioxin-free, the provincial administration announced Tuesday, refuting a rumor which began in Taiwan that has hurt local tea growers for months. The denial of the rumor came after allegations from Taiwan that tea grown in Lam Dong is tainted with dioxin, which has reduced the province’s tea exports by a half, according to the Vietnam Tea Association. Hundreds of tea producing and trading companies in the province, of which 30 are Taiwanese firms, have been hurt by the rumor. On November 11, a Taiwanese news anchor posted on his Facebook page that Vietnamese tea contains dioxin, according to Chinese-language newswire ETtoday. The news commentator said tens of thousands of tons of tea imported from Vietnam had been sealed at a Taiwanese port for investigation, and warned Taiwanese consumers not to use the product. The newswire also quoted a representative of a Taiwan-based tea company as saying that all of the products his firm imported from Vietnam passed safety standards. The Taipei Economic and Cultural Office in Hanoi has called on local authorities to look into the issue, even though the chairman of the office, Huang Chih-peng, was quoted by ETtoday as saying that Vietnamese tea exported to Taiwan is dioxin-free. But an investigation is necessary given the seriousness of the issue, Huang added. Wu Feng Shu, deputy head of Taiwan’s trade association in Lam Dong, said many Taiwanese manufacturers that have to compete with imports from Vietnam have frequently alleged that Vietnamese products are tainted with dioxin in newspapers and on television. Even though these companies do not have any grounds to back their allegations, the rumors do worry Taiwanese consumers when it comes to Vietnamese products, Wu said. 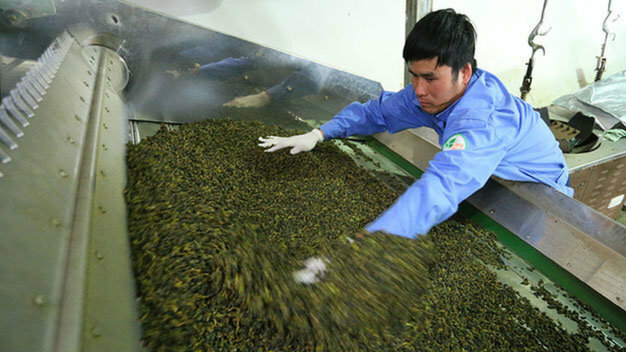 Ha Thuy Linh, director of Ha Linh Co, a Da Lat-based company specializing in exporting Oolong tea, said 11 of the company’s containers still have not cleared customs at a Taiwanese port. “The containers had to undergo stricter checks after the rumor surfaced, and customs clearance was slowed down,” Linh said. Linh said the delayed customs clearance has cost her company more than VND2 billion (US$94,135), a number that could rise if the partner demands compensation for an unfulfilled contract. Nguyen Ngoc Mai, director of Sung Vien Co, said the export operations of her company have also been hit by the rumor for more than two months. Nguyen Phuc Tin, deputy head of the provincial quality inspection agency, said his unit has recently tested 1,000 soil samples in Lam Dong and no traces of dioxin have been found. Doan Trong Phuong, deputy chairman of the Vietnam Tea Association, said a Japanese company spent years testing and analyzing land used to grow tea in Lam Dong and decided to build an Oolong tea plantation there in 2000. “If green produce in Lam Dong were contaminated with dioxin, the U.S. would certainly set up technical barriers to prevent it from entering the market,” Nguyen Van Son, deputy head of the province’s agriculture department, said. Wu, from the Taiwan trade association in Lam Dong, suggested that the provincial administration join hands with the government to host a media meeting in Taiwan to reject the rumor. This is the best way to help tea businesses in Lam Dong, she said. In 2013 Vietnam ranked 11th out of countries that exported agricultural products to Taiwan, with export volumes topping 606,806 tons, and value $408.63 million, according to the Taiwan Council of Agriculture.